The imposing silhouette of Carcassonne sits like a throne in the Light of the setting sun. The city also acts as a fortress, protecting those who live there with its inpenetrable walls. Visit the city to discover its many features and to learn why it is so magnificent. An exciting tile-laying competition between two players. 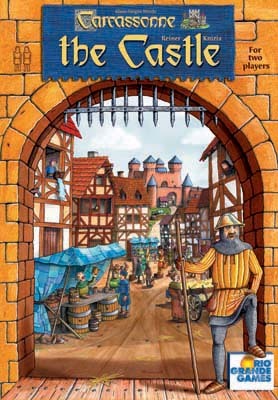 Inside the castle walls, the city grows as the players place tiles and their followers: knights to guard the towers, heralds to spread the news, and merchants to sell their wares in the markets. The player who makes better use of his followers will lead the race around the castle wall, which is also the scoring track for the game. There are several items waiting on the castle wall for the first player to reach them. Each will prove useful to the player who acquires. This game has struck a chord with my 8 and 13 year old daughters. It is similair to basic Carcassonne in many ways, but the differences are worth noting: First, it is a game for two players. Second, the tiles must all fit within a fixed, walled-in area. It plays quickly, but offers a lot of choices. As always, it is beautiful to see all the tiles laid out at the end. This is a two player game that makes for a fun, quick game of Carcassone. I still preder the original for a good strategic game, but this is fun to play with my kids when I want a quick game. Just like Carcassonne this is a tile laying game, but you are bound by the walls of the castle. It is only a 2 person game so it is much quicker then the regular one. It has its own strategic place though and is a good one to have to play with your spouse. Some Carcassonne games, such as Hunters & Gatherers, work well for two players, but this version is exclusively designed for two. The borders of the playing area are fixed, and players build inward towards the center of the castle. This is possibly my favorite Carcassonne and also stands out as the most dissimilar version to other games in the line. Very fun, fast-paced, and well-balanced. Enjoyable, quick, but deceptively deep game. It's only two players, so its not the best party game, but for a quick game with me and the misses, it can't be beat! This is a great stand alone version of Carc especially designed for 2 players. Strategy becomes important because tile laying space is limited. A new expansion is to be released soon for this game entitled "The Falcon". Definitely a good buy.